The Tennessee Bureau of Investigation released its annual Crime on Campus Report April 3, which showed Tech's crime rates are up from last year's report. "Given that Tech has such a small department, I am very pleased with this year's report," said Gay Shepherd, campus police chief, said. "I would like to have seen lower numbers in the theft categories, but that's an issue that comes with having a small department." According to the report, larceny has been the leading crime category on campus in both 2011 and 2012. Tech reported 81 theft offenses in 2011 and 86 in 2012. Several categories nearly doubled from 2011 to 2012. Tech reported gains in assault, destruction, damage and vandalism, and narcotic offenses last year. "The theft charges have increased because there are more and more students becoming too trustworthy," said Donna White, administrative associate for Tech police. "Leaving bikes not chained up and electronics out in plain sight has contributed to the increase in theft offenses." With student enrollment down by 301 according to last year's report, White said there are multiple reasons for the increased offenses, some of which are not explainable. 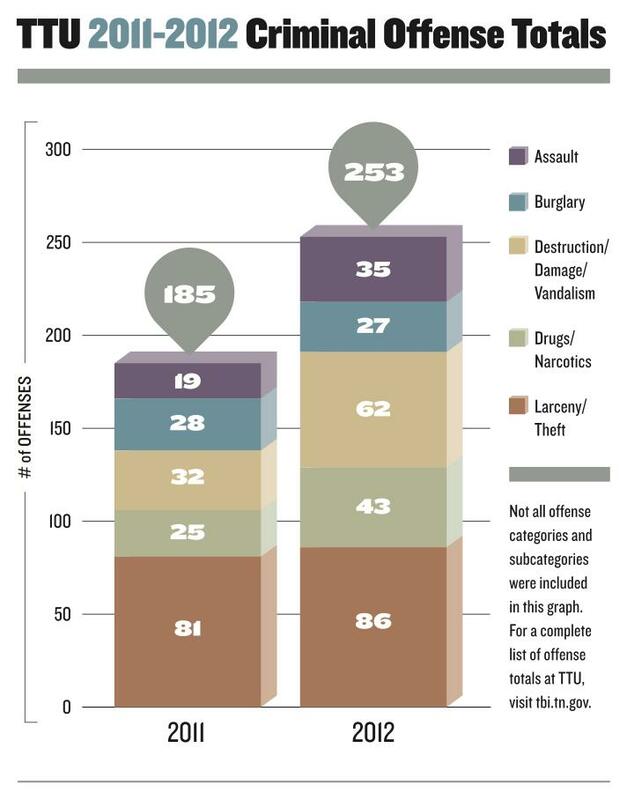 There were 35 reported assault offenses in 2012, a 16 offense increase from 2011's report. "Unless the assault happens somewhere that we can directly see it, we usually do not know about it," Lieutenant Don Frazier said. "Since the awareness of bullying has become a major issue over the past few years, I believe the increase is due to more students reporting these offenses." Drug and narcotic charges and liquor law violations totaled 68, up 15 percent from 2011's report. Shepherd said this may because of cultural differences. "Kids will be kids and make these drug and alcohol offenses," White said. "We have had several students not understand the problem with these offenses due to the legalization of certain drugs in their home state or country." Frazier said that resident life workers have been better trained to detect offenses in the residential halls and report them. He said this is the reason for the increase in offenses concerning drugs, narcotics and liquor laws. Destruction, damage and vandalism offenses are the second leading offense reported by Tech police. Shepherd said the increase in this category is also due to having a small department and the inability to create a strong presence throughout campus. According to the report, Tech's police department has 14 certified police officers for the 10,657 students currently enrolled.